X Marks the Spot + Exciting News! If you follow me on Twitter or Facebook then you may already know that I have some exciting news to share with you all! Well, I think it's exciting, I hope you guys do too. Ro (R'Chelle) of Creatively Yours invited me to be a monthly contributor to her blog and I gladly accepted! I wrote a guest post for her last year so naturally I was very open to the idea. I will be posting nail tutorials for beginners/NOTMs as well as nail health tips that I would recommend. Today's post will be a step-by-step tutorial (yes, I am actually doing tutorials now) which will allow you to create the look below. I realize that this look is a little more time consuming and maybe even a little hard for beginners (sorry!) but I really did try to keep it simple. Hopefully the tutorial is easy enough to follow. 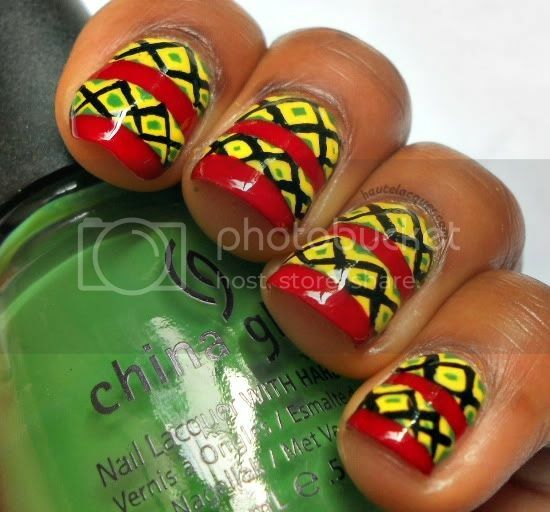 To find out more about this manicure and for a step-by-step tutorial on how I achieved this design, check out my post on Creatively Yours. Are you as excited as I am about this new collaboration? I have a quick post for you all today! This is a manicure I wore out shopping the other day, I literally woke up from a nap, did my nails, and got dressed. What can I say? I don't like going outside the house without my nails done! 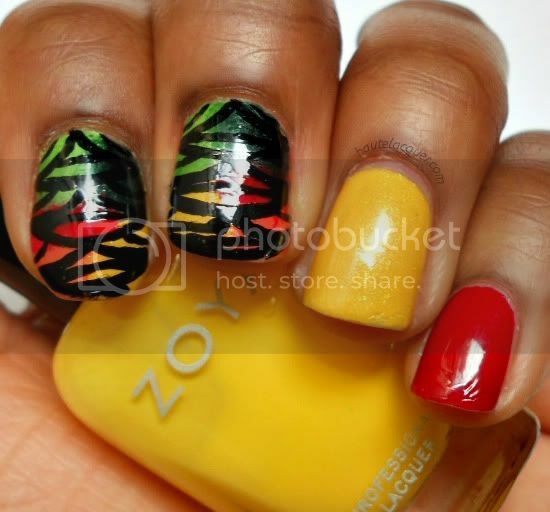 And a little side note: I'm holding Zoya Creamy in the pictures but I didn't use it in this design. For this manicure I used Barielle Soul-er Powered on the ring finger and Zoya Rekha on the pinky and thumb (not shown). The index and middle fingers were done using the sponging method. All I did was take the following colors and sponge them on in the order of yellow, orange, red, light green, dark green: Barielle Soul-er Powered, Essence What Do U Think?, Zoya Rekha, Fingerpaints Groovy Green, and Zoya Ray. I created the lines in a semi-random pattern. I did a chevron type design at first then went crazy with curved lines, lol. I finished off with top coat. This picture was taken a day after wearing this mani so please excuse the scratches. I'm not gonna lie, I'm loving the "double accent" manicure. I really do! Today's manicure is one that I've been really excited to do and finally did yesterday! I first saw it on Pinterest but never repinned it for whatever reason, a week later I googled "leopard and stripes" and this is one of the pages that came up! 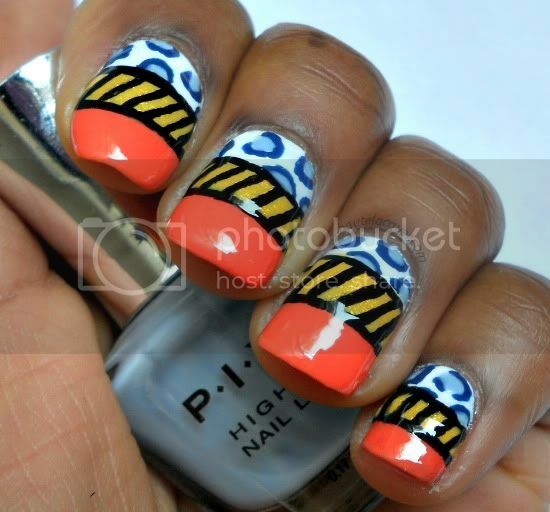 Thankfully I found it because I adore this design from Top Coat It. I changed the colors up a bit but it's basically the exact same manicure. It's your basic leopard but the pastels she used, and the stripes and gradient combo is to die for! For this manicure I used the following three colors: Rimmel Peppermint (minty turquoise), Fingerpaints Chrysanthe-Mum's The Word (green), and Essence Bloom-A-Loom (purple). For the index, middle, and pinky fingers I started with a base of the Fingerpaints polish and sponged on Rimmel Peppermint. Then I took a thin nail art brush and Essence Bloom-A-Loom and created horizontal stripes across the entire nail. For the ring and thumb (not shown) fingers I started with the Essence as the base and created the leopard design with the Fingerpaints as the outer portion of the spots and Rimmel Peppermint as the inner portion. I finished off with two coats of topcoat. Looking at these pictures, it almost looks like all the fingers have a purple base and that the stripes are gradient. Which did you see first, the gradient stripes or the purple ones? Today's design is a design that I did days ago but wasn't happy with so I delayed posting it. I figured I'll post it anyway because I really liked the idea for this manicure. 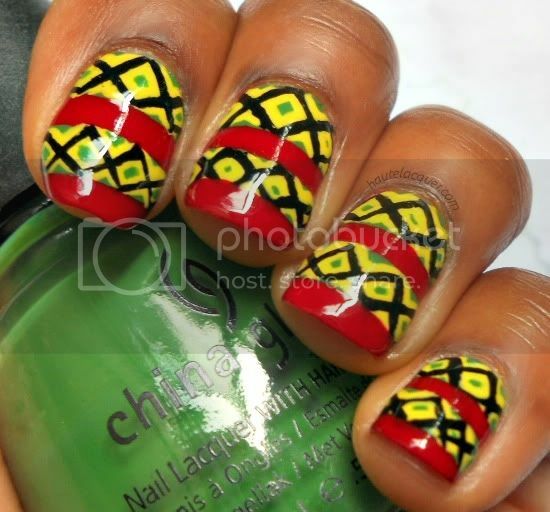 I googled "African tribal prints" and drew my inspiration from all the different pictures. 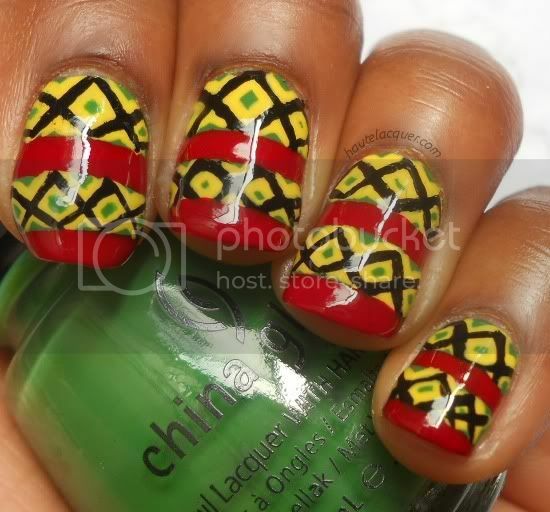 Before removing the manicure I showed my sister and she was all "oh it looks very African-y!" and I decided that I'd post it if she could tell what it was without me telling her! For this manicure I started with China Glaze Starboard as the green base. 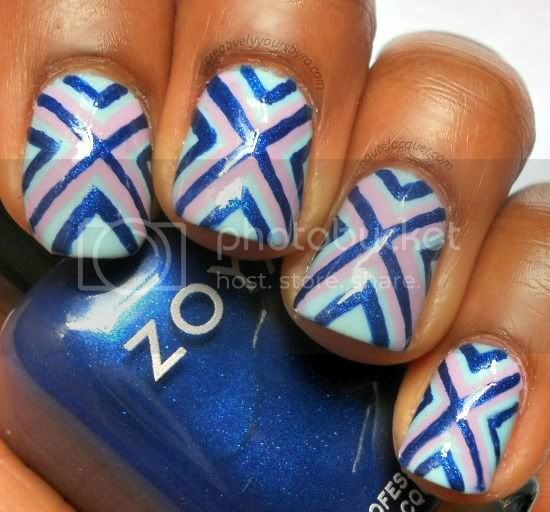 Then taking my nail art brush and Zoya Creamy I created the lines as if they were capitals X's all connecting together at the tips. After that I used a thin nail art brush and created the black lines the same way. The green will peek through using this method. 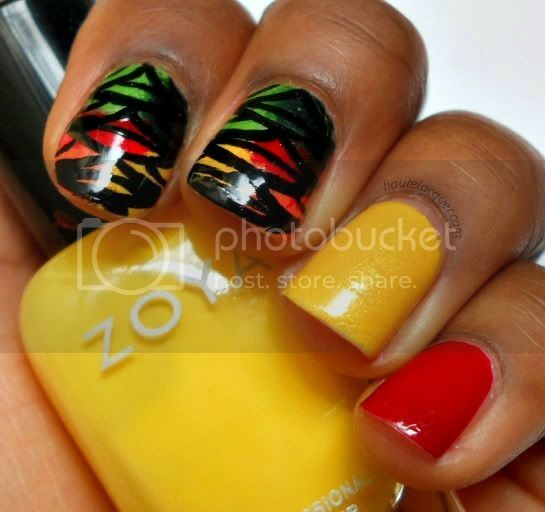 I created the red stripes with Zoya Rekha. 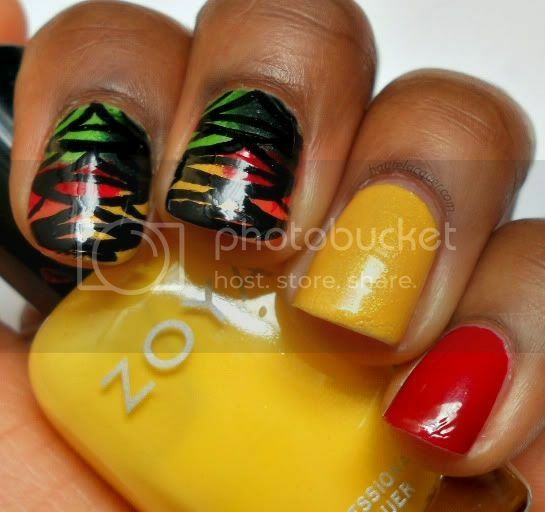 I absolutely loved the idea of this manicure but I just don't like the way I executed it. But the perfect manicure really doesn't exist, right? I'm so happy to be able to post this today, you don't even know. I had a huge break on my pinky last week and didn't want to shorten all my fingers down to such a tiny length so instead I just let that one be. 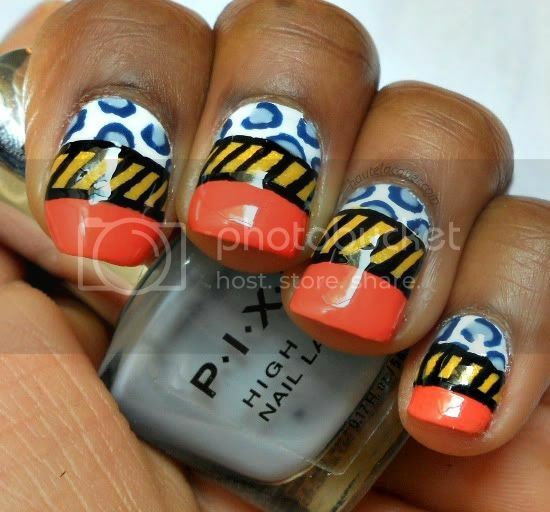 Anyway, the idea for this manicure came from the other striped manicures I've done in the past, here's just one. It's one of my favorite types of designs to do. For this manicure I used Wet N Wild French White Creme for the white base, Barielle Soul-er Powered for the yellow base, and Essence What Do U Think? (horrible name, sorry had to mention that) as the orange base. For the leopard print I took my nail art brush and China Glaze First Mate to make the outlines of the spots. I filled in the spots with Pixel Naughty Bit Nice (another bad name). 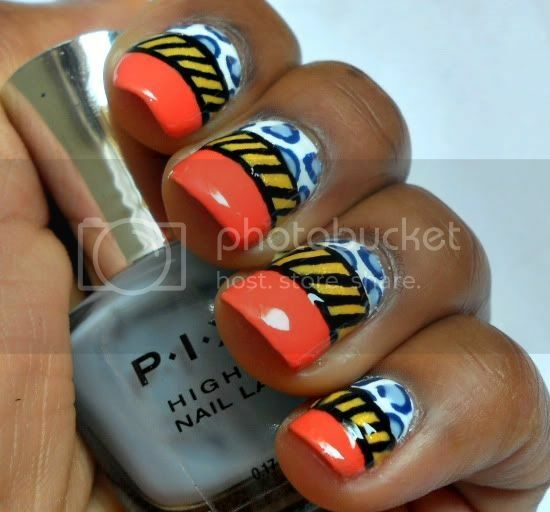 The stripes were done with Wet N Wild Black Cream and a nail art brush. After painting on the orange stripe I finished off with top coat. I apologize for the smeared polish on some of the pictures, didn't even notice until I started editing them...oh well, what can you do?